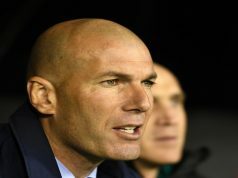 Real Madrid became the Spanish club with more consecutive straight victories in history, earning their 19th consecutive win in all competitions and beating Frank Rijkaard’s Barcelona’s record. Los Blancos eased past Ludogorets at the Santiago Bernabeu thanks to goals from Cristiano Ronaldo, Gareth Bale, Alvaro Arbeloa and Alvaro Medran. Things became a lot easier for Carlo Ancelotti men with just 20 minutes on the clock. Marcelinho was sent off after handling the ball on the line, and Ronaldo step up to score the penalty kick with a delicate touch. 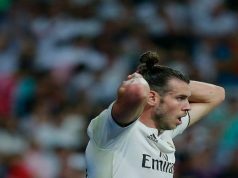 From that moment on, Real dominated the game without much effort, and Gareth Bale made it 2-0 before half-time with a superb header, following a corner kick from Toni Kroos. 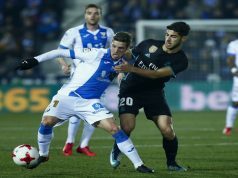 The second half was a nightmare for the visitors, who were unable to stop Los Merengues from threatening their goalkeeper every two minutes. Yet, Vladislav Stojanov had an outstanding performance and saved his team from a harsher defeat. Nevertheless Arbeloa and Medran would make it 4-0 in the last stage of the match. The right-back fired a shot from short range following a corner kick. The keeper got a hand to it but the referee deemed that the ball had crossed the line. The youngster came in from the bench in the second half and scored his first goal for Los Blancos first team in his Champions League debut. The 20-year-old slashed a left-footed shot from 25 metres, which deflected of Anicet and looped over Stojanov to drop in the back of the net.